Everyone seemed to have a really good time too. Christie has some wonderful friends and family. It was so much fun getting to know them better. Here's a pic of the hostesses with the guest of honor. Of course, there are more pics in the album. Thursday after work, Ross, Jackson and I met up with some friends and their adorable kiddos at our favorite Mexican restaurant, Lupe Tortilla. It was a gorgeous day, so we sat outside and watched the kids play in the huge "sandbox". 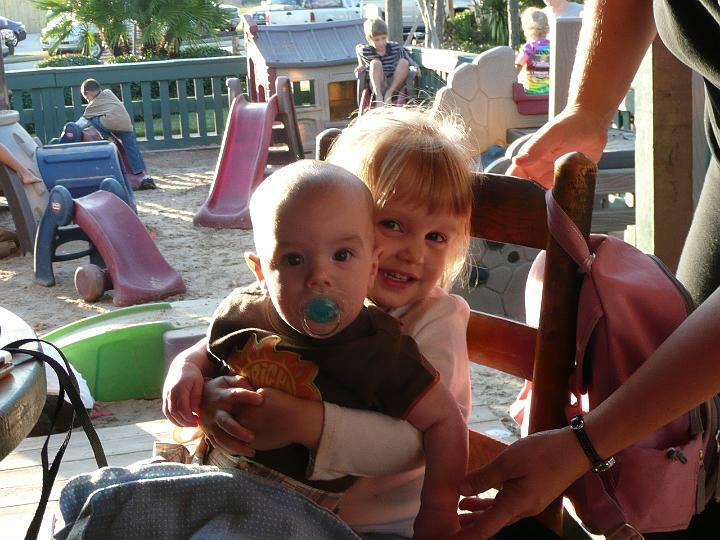 Their middle kid, Elena, very nicely asked to hold Jackson...how cute are they?! Then we had an impromptu visit from some friends from LA Tech yesterday. Tammy, Marc, and Bryan were headed to this side of town for the air show at Ellington Field. 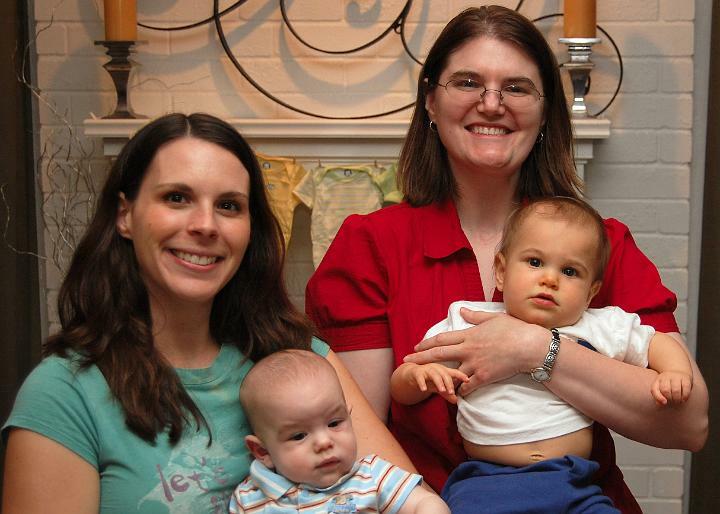 Tammy was one of my roommates and a sorority sister in college, so we were thrilled to get to see them and finally introduce Bryan and Jackson to one another! I got nothing when I tried to start my vehicle this morning! Ross was home, so we were able to jump the battery and get it started, but I just have to wonder when my string of bad luck with this vehicle is going to end! Jackson got an exersaucer last weekend, and he has been loving it. I can't believe how many parts they come in! I guess this is probably just the beginning of many, many hours we will spend putting together toys for Jackson. Even Carter put in some time helping us put all of the pieces together. Columbus day was a holiday for those of us that work for the government, so Ross and I took advantage of the extra day and started working on our front yard, which was in desperate need of some attention. Since Jackson came along, it's been left untouched with the exception of the occasional mowing that the summer necessitates. Ross spent several back-breaking hours extending flower beds and putting in edging. In the process he took out a good chunk of a root from the tree in our front yard, so we're hoping it doesn't die or fall on our house! We finished the majority of the planting work yesterday. We still have a few more flowers to plant and some mulch to put down, but it's looking a lot better! We have some plans to extend our front porch/patio as well, but that will have to wait until after Ross gets back from Hawaii. I spent most of my evenings this week preparing for 2 baby showers. The first one for Jennifer and Eric was today, and the second one for Christie will be next Sunday. 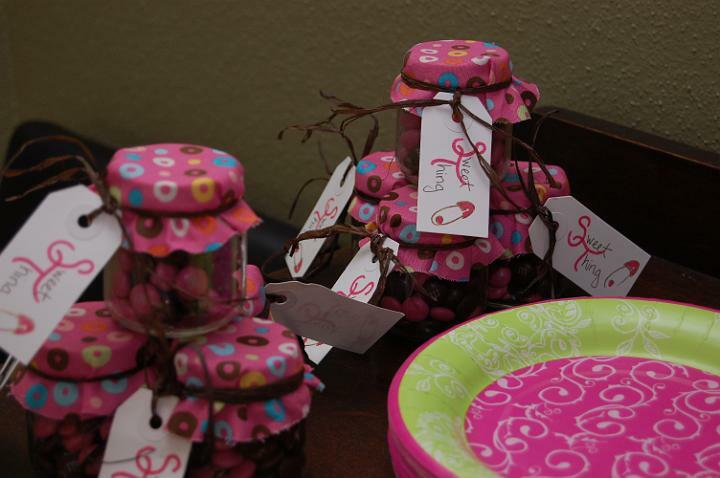 I had a lot of fun putting together these "sweet thing" favors and making a diaper cake for the shower today. 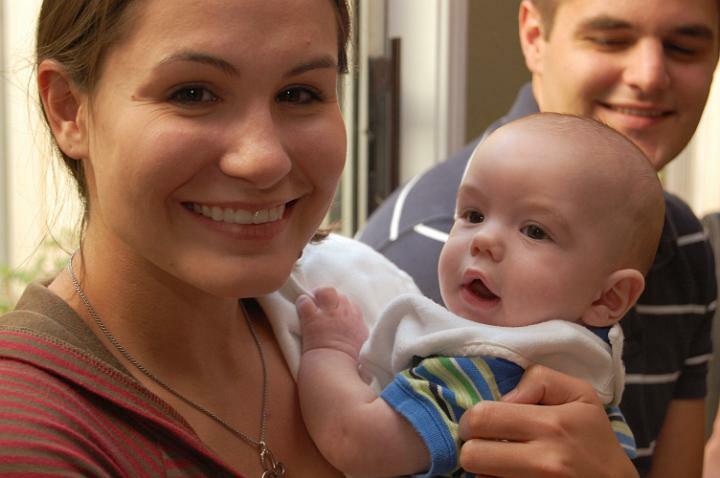 Of course, we can't have a summary post like this without at least one picture of Jackson, so here's a picture of Pam holding our sweet little boy. He had his 4 month checkup this week, and is continuing to grow at about the same rate. He's a little above the 50th percentile in height now, and he's still in the 25th percentile in weight and head circumference. The doctor said we could start him on solids whenever we're ready. It may not be long, but I'm not ready just yet! We've posted pics from the shower today and our visit with the Tims in the album, so be sure to check them out! Way back in May, I posted about the presidential candidates' charitable giving (or lack there of). Well, now the vice presidential candidates have released their returns as well, so I figured it was worth revisiting. In summary, I am appalled by the lack of charitable giving by the people who are vying for the opportunity to run our country. Before talking about the vice presidential candidates, let me update a couple of things from the previous post. McCain has since released a snapshot of his wife's return for 2006. This, combined with a misread of his return on my part, makes his giving much less impressive. First, I said that he gave 28.6% to charity in 2006 but I didn't notice that part of this was carryover from the previous year. In actuality, he gave 19% which is still good until you consider that he claims half of the family's combined giving so when you factor in Cindy's $6 million dollar AGI, the combined giving is reduced to right at 2%. Their charitable giving nearly doubled for 2007 but we still don't know what Cindy made in 2007 so I can't give a percentage. No, those are not typos, Joe Biden and his wife have averaged $369 in charitable giving over the past decade, or 0.15% percent of there AGI. WOW! This is despicable. As, I mentioned in my previous post, the average American gives ~2.2% of their AGI. I find it particularly disgraceful that candidates running on a platform of increased taxes for the rich to support programs for the less fortunate give at these low levels. If you want to support programs for the less fortunate, do it by giving to charity. While the Palins giving is certainly not staggering, given their relatively low AGI compared to the other candidates, these numbers are not bad. The kickoff of the game today didn't look so good for the Cowboys, so Jackson changed clothes and is cheering them on in hopes that will change the tone of the game! 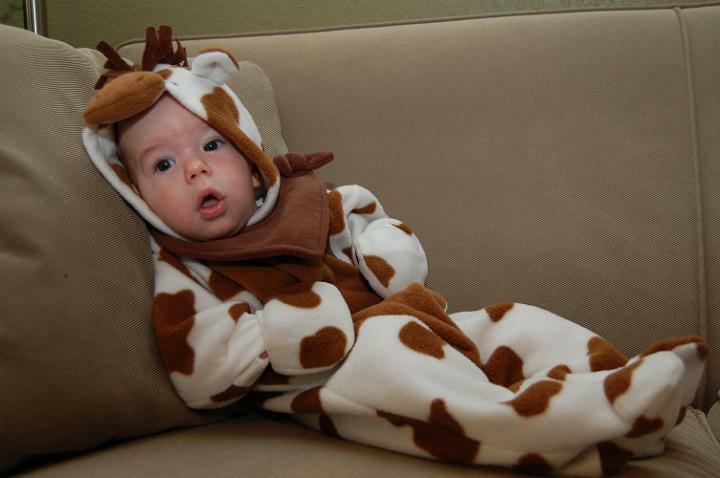 Okay...so I found out it's really a giraffe costume, which makes SO much more sense! It's pretty cute either way though! 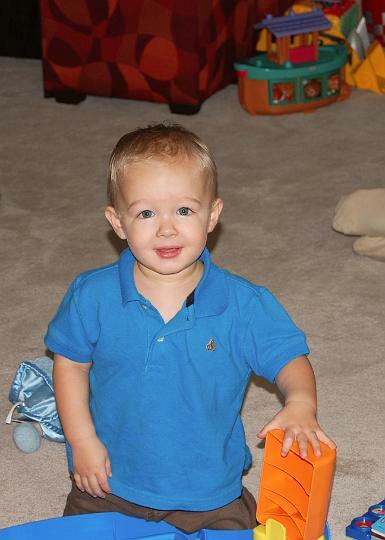 Today I was going through some of the clothes that our friends Heath and Barbara let us borrow for Jackson. 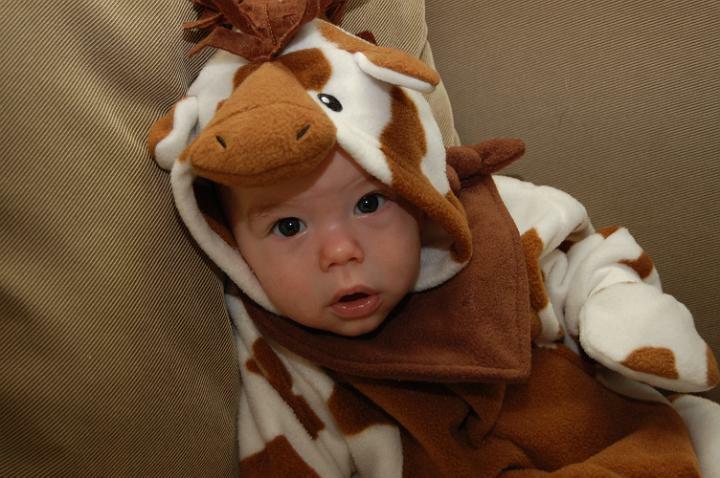 He's just about ready for the next size up, so I was sorting through their hand-me-downs when I ran across Carter's horse costume from Halloween last year and had to try it on Jackson...pretty cute! There were some positive things that happened yesterday too. While I was getting ready in the morning Jackson woke up and rolled over in his crib! Also, the whole flat tire thing allowed me the opportunity to get to know 2 of Jackson's teachers better. While I was waiting for help, I called the daycare to let them know it was probably a good idea to give J another bottle since I was running late. When I arrived, he was the only baby there and was eating, so I got to sit down and get to know them a little better! 3 flat tires in 3 weeks! Need I say more? It doesn't help that I don't know how to change a tire...actually I know how. I've just never had to physically do it, which is pretty much the same thing. Ross has been out of town for 2 of the 3, so I had to call on other gracious men to help me. My brother-in-law, Philip, helped with the first by plugging it, and today two of my coworkers came to the rescue and put on the full size spare. I'm not sure I could have done it on my own if I had to. Those tires are heavy! Of course, I was already in a hurry when I got to my car and found the flat...fortunately it didn't happen while I was driving. I also happened to be barefoot, which my rescuers found entertaining. This morning when deciding what to wear, I opted for a cute pair of 4+ inch heels that I know aren't good for walking around in, but I was planning to be at my desk all day so that was ok! Well, shortly after getting to work, which involves a short hike from the car to my office, I had to walk some information to my bosses that was urgently needed for a meeting on the other side of the campus. Normally this wouldn't have been a big deal, but these shoes leave awful blisters! By the time I got back to my office, my feet were bleeding. Lesson learned...if choosing to wear these shoes to work, bring an extra pair of walking shoes! The worst part of the day was that the flat tire made me later than usual picking up Jackson, so I didn't get to spend any time with him tonight. We got home, and he went straight to bed like the good boy he is! Ok...I'm done venting. Tomorrow should be better...Ross is coming home!